The countdown of our 12 Modern Lamps of Christmas 2011 continues. To see how I went about choosing the lamps included in this year’s list, click here. A lamp with “work” in its name might not be immediately obvious as a fun Christmas gift, but you can see it does much more than just help with chores or paperwork. The Work Lamp was designed by Form Us with Love, a design team from Stockholm, to bring lighting you’d normally see hanging in the garage into the living room. It has a bare bulb that is surrounded and protected by a sturdy iron wire frame. More than that, this frame is what gives this lamp its unique character, its substance. (In case you think I’m overstating the frame’s importance, just imagine the lamp without it). It is also the lamp’s main decorative feature, gleaming in Silver or Gold. 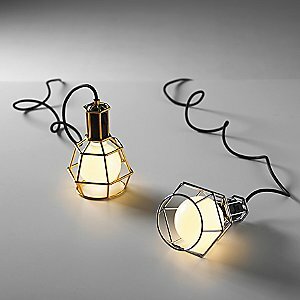 With a plug-in cord and switch on the base, this light can be strung up like a pendant or set on a table like a table lamp. It’s small, too, so it provides great impact without taking up too much room. To sum up, the Work Lamp is fun, petite and beautifully industrial. 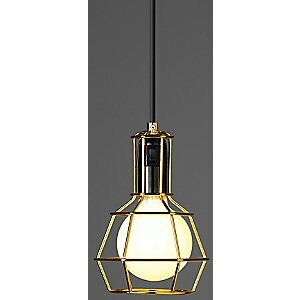 It makes a great accent piece and source of light in any room of the home (or out in the garage, if you so choose). So when it comes to being a cool gift, this light really does work.